Half of Vietnam’s most popular foods come straight from the Mekong, so one can imagine that Can Tho City’s restaurant and street is abundant in delicious and recognizable dishes known throughout the country. For popular food streets, it’s a good idea to check out Cai Khe and De Tham, both brimming with great street food. The night market operates from around 4 p.m. to early next morning, and provides some decent street eats. But it’s better for a stroll and a sinh to rather than a meal, as there are better priced and higher quality stalls and open-air restaurants away from the pier. 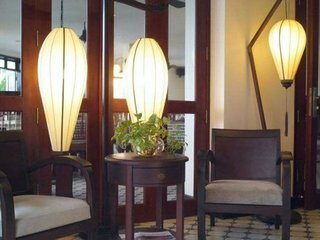 For more Western-style restaurants, see L’Escale at the Nam Bo Boutique hotel, or Sao Hom, a French and Vietnamese restaurant with a good vegetarian selection. Can Tho City’s notable dishes include: cha gio re (spring rolls), hu tieu (noodle soup), banh xeo (fried pancake), banh khot (miniature pancakes). There is, of course, seafood everywhere - but you’ll mainly be eating river catches. Ocean seafood would be arriving from Nha Trang and Vung Tau.